When the rice is fully cooked and piping hot, place it quickly in a wooden or metal bowl and fluff with a rice paddle. Pour the seasoned sushi vinegar (see next step) over it and mix thoroughly trying not to break the grain, then let it cool down. Mix unseasoned rice vinegar, sugar and salt in a small pot and dissolver everything. You may heat the mixture up to make it easier. Slice red pepper, cucumber and smoked salmon (as a whole chunk) into thick stripes and set aside. Place the sushi rolling mat on a flat, clean surface, then place the nori sheet on it with the shiny part down, longer side facing toward you (and the rough part up). Using a rice paddle, make a 5mm-thick layer of rice over 2/3 of the nori sheet height (and whole width). 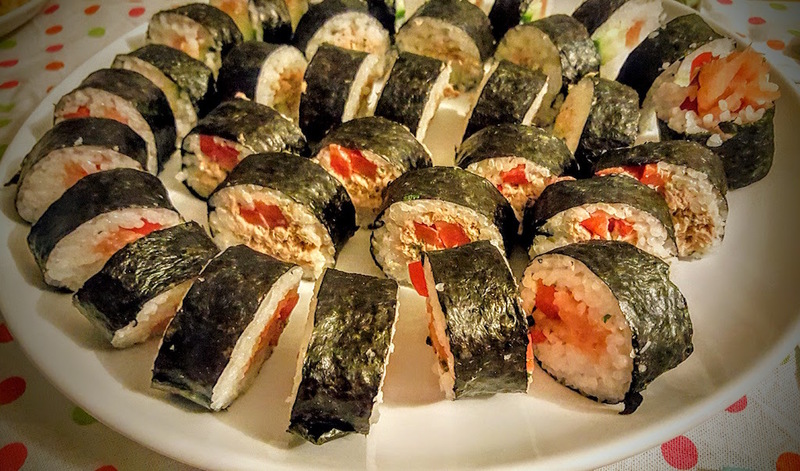 Fill a full-width strip of filling around 1/3 of the height of the nori sheet from the top (making some space for initial rolling), making one of the combinations: smoked salmon with red pepper, smoked salmon with cucumber, tuna paste with red pepper, and tuna paste with cucumber. Start rolling from the top, trying to close the top ending right after the filling ends , then press gently along the way and keep rolling as long as you have nori sheet that is not attached to the roll. Adjust the filling on both ends using the flat side of the knife and slice into 2cm-wide slices.